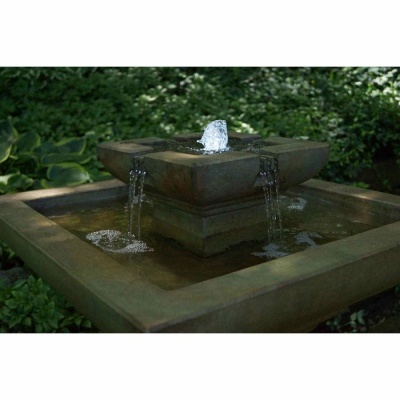 Henri Studio Falling Water Fountain Water Feature promises an inspired outdoor garden fountain that has been hand finished by renown Henri sculptors. Creates a stunning focal point in any garden adding a calming addition to the natural ambience that exists there. 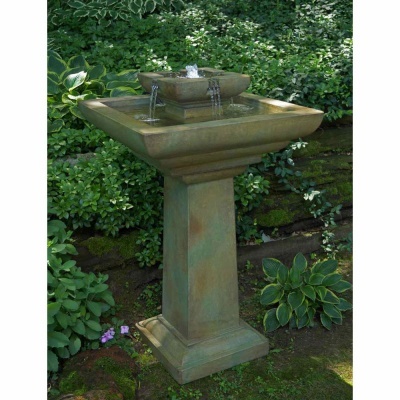 Water gently cascades from the centre though the 4 symetrical channels, and romantically arrives into the main bowl. Henri high quality re-circulating water pump (included) recycles water back to the top to be enjoyed again, ensuring no water is wasted and no mains water connection is required. 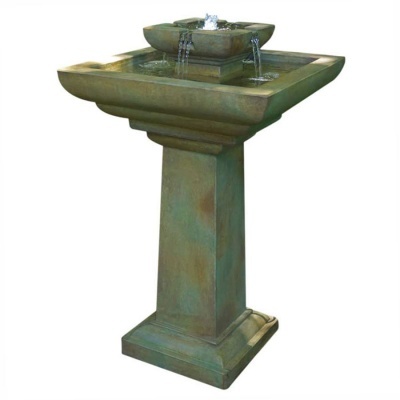 Premium hand crafted stone self contained water feature benefits from Henri's Relic Nebia aged green finish. Falling Water fountain is LED illuminated to highlight the central water jet which is the focal point of the feature.